The Tampa Bay Buccaneers made the hilarious decision to release Josh Freeman on Thursday, making him available to sign with any team he chooses. According to ESPN sources, the Bucs contacted each of the 31 other teams but were unable to find a taker for Freeman (or, more accurately, Freeman's $6.2 million cap hit). Freeman is now three years removed from a particularly strong 2010 season, when he threw for 25 touchdowns against just six interceptions, and finished 6th in the league in passer rating. His 2011 season was undoubtedly disappointing (regression was not kind to Freeman - his interception rate spiked from 1.3% to 4.0%), but he bounced back with an respectable 2012, throwing for over 4000 yards and finishing 18th in Total QBR among 39 qualified candidates. 1. The Buccaneers have zero receivers capable of drawing the defense's attention towards the middle of the field, away from Vincent Jackson and Mike Williams, and the coaching staff seems to have no strong interest in designing plays that might manufacture that effect. 2. Josh Freeman has metric numbers through four weeks competitive with Eli Manning and Joe Flacco, the starting quarterbacks for the last two Super Bowl winning teams, neither of whom have been benched or released. The obvious counter to the second point is that Manning and Flacco are "Super Bowl-winning Quarterbacks," but such an argument operates under the assumption that quarterbacks who have played for Super Bowl-winning teams possess an inherent advantage over those who have not, which simply isn't true. Using Total QBR as one example, Freeman's score last season of 53.1 (18th-best) was substantially better than Flacco's score of 46.8 (25th-best). The reason the Ravens made the playoffs and Bucs watched from home had little (if anything) to do with the play of their quarterbacks - it was probably that Tampa Bay allowed 4758 passing yards, the 2nd-highest total in NFL history, and the Ravens, well, didn't. Jake Locker is going to be out for at least a month, possibly two. The Titans are 3-1 and actually look like playoff material. Ryan Fitzpatrick came on in relief of Locker and performed just fine, but that was a game already well in hand, and let's be honest, it's Ryan Fitzpatrick. If Tennessee brings in Freeman immediately, it still wouldn't be in time for him to start Sunday against Kansas City, but that's not a huge deal - they probably aren't going to win that game in either case. But he could be ready in time to play at Seattle on October 13, a game they desperately need a real quarterback for if they want any hope of winning. Bringing in Freeman would be a low-risk move as a stop-gap until Locker is healthy. For a team looking to make a playoff push, you can do a lot worse. Both teams are still vaguely in the mix as potential AFC Wild Card teams, and both could stand to upgrade at quarterback - Buffalo especially, after E.J. Manuel left Thursday's loss with an apparent knee injury. However, the idea of bringing in Freeman doesn't seem to make sense for either team. The team that brings in Freeman will likely either be (a) a team completely unsatisfied with their current quarterback situation and is looking to either salvage Freeman's career or jettison him after the season and draft a new quarterback, or (b) a contender with a shaky backup looking to add some security. The Bills and Jets don't fit either one of those. Both teams have rookie quarterbacks, and it may cause more harm than good to bring in another young quarterback with long-term potential that may impede the long-term progression of the quarterbacks they already have. 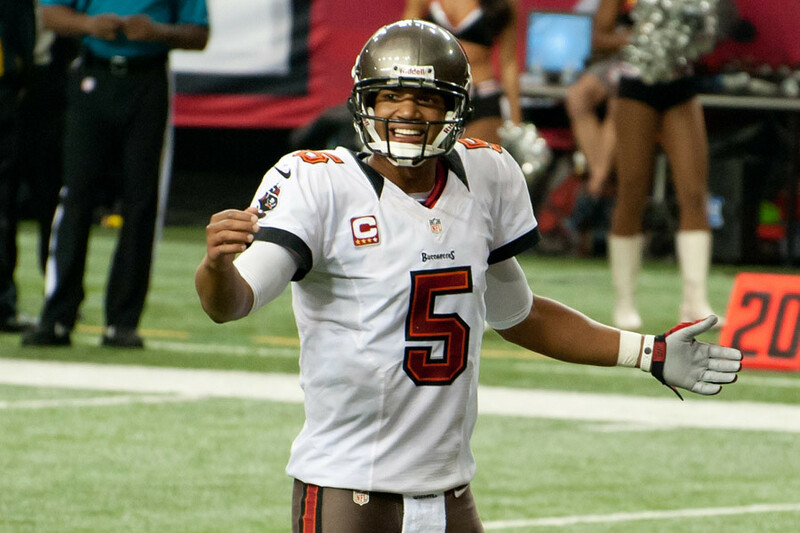 It would be one of the most Jerry Jones things ever to sign Josh Freeman, wouldn't it? It would basically be the same rationale as the Titans, only with even lower risk, considering the Jaguars don't have a first-place standing to squander if he doesn't work out. Blaine "Yo Gabba" Gabbert might be the worst quarterback in NFL history that wasn't drafted immediately after Peyton Manning, so the Jags might try to get a head start on finding his replacement with Freeman. Michael Vick might be on his last trip around the carousel - he's already 33 years old, has taken a ton of hits over the years, and will likely continue to do so in Chip Kelly's offense. Freeman is certainly a more mobile option than Nick Foles, and has proven to be exceedingly durable over his time as a starter. It should be mentioned that if, God forbid, anything were to happen to Peyton Manning, their current backups are Brock Osweiler and Zac Dysert. After winning against Buffalo last night, the Browns are now 3-2 and inexplicably in first place in the AFC North. When they traded Trent Richardson three weeks ago, it seemed like they were giving up on their season. Now the postseason seems like a realistic goal. With Brian Hoyer out for the season with a torn ACL, adding Freeman would be a solid move for the Browns. As bad as Freeman has been this season, he hasn't been anywhere as bad as Brandon Weeden (and is five years younger to boot), and Freeman has decidedly more upside. As the new front office continues to distance itself from the previous regime, signing Freeman could be a zero-risk, high-reward move. It would be perfect timing, as Cleveland already played this week and Freeman would have a full week to prepare for Detroit in Week 6. After that, they play at Green Bay, at Kansas City, and home for Baltimore before their Bye in Week 10. That's four straight playoff caliber teams for Freeman to showcase himself against, to try to prove he's a long-term solution. If Cleveland wants to hang on for as long as possible, you'd have to think they realize Weeden isn't an option. Freeman would be an immediate upgrade over Weeden (and possibly even an immediate upgrade over Hoyer, depending on your pessimism towards Freeman), which is all you can ask for as a team fighting for a playoff spot.